Philadelphia 76ers center Joel Embiid is seen on the bench in a break in action against the Oklahoma City Thunder during the fourth quarter at Chesapeake Energy Arena. UPDATE: The worst possible outcome has come true for the Sixers. According to a press release from the team, Joel Embiid has been diagnosed with a concussion in addition to an orbital bone fracture of his left eye. No timetable has been set for Embiid's return to the court. As the result of an injury suffered in the first half of Wednesday night's game against the New York Knicks, Joel Embiid has been ruled out for the team's upcoming road trip over the weekend. Embiid collided with Markelle Fultz during a play early in the second quarter of Philadelphia's 118-101 win over New York, and remained on the ground for several minutes before walking back to the locker room under his own power. Initial X-rays were negative and concussion tests at the arena ruled he had not suffered a concussion, but Embiid was ruled out for the game with a facial contusion. He was taken to a local hospital to undergo further evaluation Wednesday evening, and was not released until sometime on Thursday afternoon. Embiid released a brief video on Instagram late Wednesday night, sharing a message of "not good" while laying in a hospital bed. 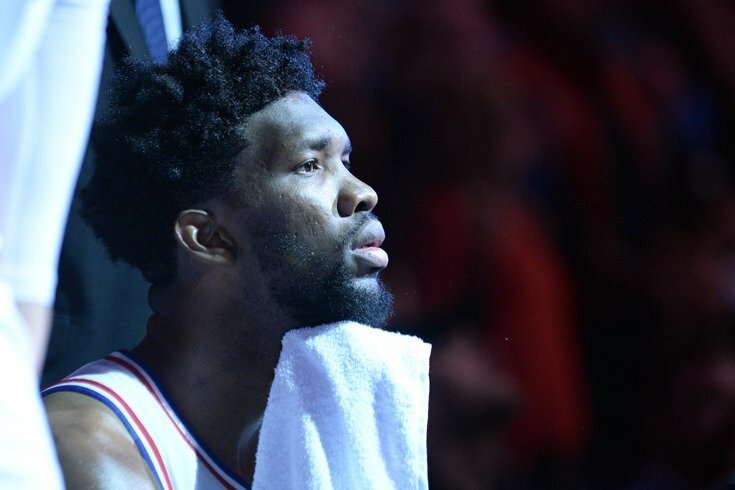 The Sixers have yet to issue a formal update regarding his status, but a team source indicated to PhillyVoice that the delay in a formal update was due in part to finalizing the exact diagnosis for Embiid. As of 3:30 p.m. on Thursday afternoon, the Sixers had not ruled out the possibility of either a facial injury or a concussion, despite the initial optimism suggested from the instant tests at the Wells Fargo Center. Philadelphia would not provide an official timeline for when an update might come, but the Sixers hope to provide an update with more detail at some point Thursday evening, per a source familiar with the situation. The man who collided with him was apologetic following the game on Wednesday. The Sixers play the Atlanta Hawks and Charlotte Hornets on the road before returning to play their next home game against the Brooklyn Nets. MORE: Sixers lose Joel Embiid to injury, rally to earn win over hapless Knicks | Maurice Cheeks reportedly selected to join Naismith Basketball Hall of Fame | Which potential first-round opponent is best matchup for Sixers in playoffs?